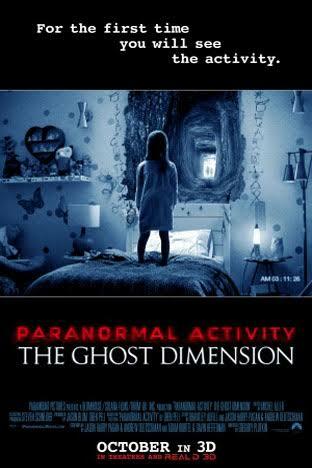 I recently saw the new movie Paranormal Activity: The Ghost Dimension at Theatres at Mall of America with my sister. The movie theatre was packed and we sat in the middle. The beginning of the movie had a slow start like in the other ones. When I was watching the movie I got kinda bored because at times nothing was really happening. It is more interesting when you start seeing things move around and start getting scared. The movie was about a man and his wife and daughter that are getting ready for Christmas in their new house. After moving in they come across an old camcorder. Later, the husband (Ryan) found out that the camcorder can record strange apparitions that you can’t see. Then, their daughter (Leila) starts talking to an imaginary friend and she starts acting strange. They then find themselves in a terrifying battle with a supernatural force. Overall, it’s a good movie. On a scale from 1-10 I give it an 8.5 because of how it’s kind of slow when the scary parts were not happening. Also, if you thought you were getting closure, you’ll be disappointed but overall it’s a great film. I recommend this film to people who liked the previous Paranormal Activities movies, and like being scared.